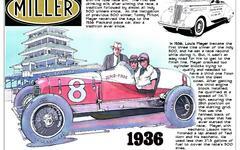 These are articles that concern the Indianapolis Motor Speedway's plans for the 1910 season. The Speedway considered a variety of events for the year from auto races to car shows to aviation events and more. In many instances they spoke with certainty that events would happen but then failed to deliver. This article in attachment IMSaero122009 originally appeared in the December 17, 1909, Indianapolis Star and concerns Indianapolis Motor Speedway plans to stage aviation and gas balloon competition in 1910. The article also touches on plans for auto races. This article was published in the January 7, 1910 Indianapolis Star. I find the article interesting in that it further illustrates how Indianapolis Motor Speedway President and Founder Carl Fisher wanted to use the track as a multi-purpose facility. In addition to the obvious auto races but the vision of the track as America's capital of aviation. The main article attached (IMSdrivers010910) here was first published in the Indianapolis Star on January 10, 1910. The article concerns efforts by the management of the Indianapolis Motor Speedway to secure American Automobile Association (AAA) sanction for an amateur race meet during the 1910 summer season. This article first appeared in the January 16, 1910 Indianapolis Star and is a super-outstanding follow-up to another article that appeared on January 9, 1910. This article originally appeared in the January 22, 1910 Indianapolis Star. It is further evidence of Indianapolis Motor Speedway Founder and President Carl Fisher's borderline obsession with early airplanes and aviation. This first article attached here originally appeared in the February 12, 1910, Indianapolis Star. It reports on the pending arrival of S.M. This gem of an article (Attachment Moross010410) about the work of the Indianapolis Motor Speedway leadership to obtain the choice events of the 1910 racing season was published in the January 4, 1910 Indianapolis Star. Leading the charge was Speedway Contest Director Ernie Moross. This article was published in the February 15, 1910 Indianapolis Star. It concerns the Indianapolis Motor Speedway's continued quest for the right to host the second annual international aviation show. This article first appeared in the January 20, 1910 Indianapolis Star. This article concerns the machinations of the extended decision-making process over an American venue for the 1910 international air show. The primary article attached here (IMSaero030710) was first published in the March 7, 1910 Indianapolis Star. It concerns the Indianapolis Motor Speedway's plans for both airplane and gas balloon air shows in 1910.